Peroxisome proliferator-activated receptors (PPARs) are ligand-activated transcription factors with diverse actions. PPARα and PPARγ are expressed in different lymphocyte subpopulations. Recently, we have observed that PPARα ligands elicit augmented IL-4 expression in cultures of mitogen-activated splenocytes. The following studies were undertaken to characterize the in vivo effects of WY14,643, a PPARα ligand. Our studies demonstrate that oral administration of WY14,643 markedly reduces splenocyte number in immunized and nonimmunized C57BL/6 mice. Mice fed WY14,643 display impaired IgG responses to myelin oligodendrocyte glycoprotein peptide 35–55 (pMOG35–55), following immunization with pMOG35–55/CFA. Following in vitro restimulation with pMOG35–55, splenocytes harvested from WY14,643-fed mice demonstrate impaired production of IFN-γ, IL-6, and TNF-α despite similar proliferative responses. We also demonstrate higher expression of PPARα in B than T cells. Finally, to obtain an understanding of the cause of splenocyte depletion with fibrate therapy, we studied the effect of WY14,643 on apoptosis of activated splenocytes. WY14,643 in vitro induces apoptosis in lymphocytes and this effect appears to occur in a PPARα-independent manner. Thus WY14,643, a fibrate, is a profound immunosuppressive agent. Peroxisome proliferator-activated receptors (PPARs)4 are ligand-activated transcription factors that regulate a large number of diverse genes by transcriptional activation and repression (1, 2). The PPAR subfamily of receptors is encoded by three genes, α, δ (β and NUC1), and γ, each with distinct expression patterns (3). PPARα regulates lipid homeostasis and is a target of fibrates, which are used clinically for the treatment of hypertriglyceridemia (4, 5). Fatty acids and eicosanoids are endogenous ligands for PPARα (6). Ligands for PPARγ include the insulin-sensitizing thiazolidinediones and 15-deoxy-Δ(12, 14) PGJ2 (7, 8). PPAR isoforms are differentially expressed in immune subpopulations. Recently, we and other investigators have identified PPARα in lymphocytes. PPARα is more highly expressed in B than T cells and its expression wanes soon after lymphocyte activation (9, 10). In contrast, PPARγ is expressed in both T and B lymphocytes and its expression increases over several days following T cell activation (10, 11, 12, 13). As in macrophages, PPARγ expression in lymphocytes is up-regulated by administration of IL-4 (10, 14). PPARs have been shown to possess anti-inflammatory activities (15, 16, 17). Moreover, administration of PPARγ ligands is reported to attenuate inflammation in murine models of inflammatory bowel disease (18), nonobese diabetic mice (19), rodent models of atherosclerosis (20, 21, 22) and experimental allergic encephalomyelitis (EAE) (23, 24). Studies performed in lymphocyte subpopulations have also confirmed the anti-inflammatory actions of the PPAR ligands (11, 25). Recently, we have observed that PPARα ligands elicit augmented IL-4 expression in cultures of mitogen-activated splenocytes (10). However, this response occurs in a PPARα-independent manner. The goals of the current study were to determine whether oral administration of WY14,643, a PPARα ligand, could alter adaptive immune responses in C57BL/6 mice. These studies show that in vivo treatment with WY14,643 alters the humoral and cytokine responses to a defined Ag. WY14,643 feeding also causes profound decrements in splenocyte number in both immunized and nonimmunized C57BL/6 mice. We have also investigated a potential mechanism accounting for the observed decline in splenocyte number. The final objective of these studies has been to determine whether the WY14,643-induced decline in splenocyte number occurs in a PPARα-dependent or -independent manner. In summary, the current work complements previous in vitro studies of PPARα ligands and demonstrates in vivo that WY14,643 can exert profound immunosuppressive effects. C57BL/6 and BALB/c mice were obtained from The Jackson Laboratory (Bar Harbor, ME). The mice were used between 6 and 24 wk of age. Mice were housed and handled in accordance with Veterans Affairs and National Institutes of Health guidelines under Institute of Animal Care and Use Committee approved protocols. Mice were individually housed when receiving drug or vehicle control in their food. PPARα wild-type and homozygous knockout (KO) mice on a 129/Sv background were obtained from breeding pairs established by Dr. F. J. Gonzalez (Laboratory of Metabolism, National Cancer Institute, National Institutes of Health, Bethesda, MD). IFA and Mycobacterium tuberculosis were obtained from Difco (Detroit, MI). Myelin oligodendrocyte glycoprotein peptide 35–55 (pMOG35–55) was purchased from Research Genetics (Birmingham, AL). CFA was prepared as 4 mg/ml M. tuberculosis and 3 mg/ml pMOG35–55 emulsified 1:1 with IFA. Pertussis toxin (List Biological Laboratories, Campbell, CA) was prepared as a 4-μg/ml suspension in PBS. A 100-mM stock solution of WY14,643 (ChemSyn Laboratories, Lenexa, KS) dissolved in 100% ethanol was used for in vitro studies and a 27.8-mM (9-mg/ml) stock solution was used for in vivo feeding. Con A (Sigma-Aldrich, St. Louis, MO) was used at concentrations of 5 μg/ml. Gerber brand second foods baby food (113 g/jar) was obtained from a local grocery store. Mice were immunized with 200 μl of pMOG35–55/CFA emulsion s.c. at the base of the tail. For the EAE studies, mice were simultaneously injected with 50 μl of pertussis toxin (200 ng) i.p. The i.p. pertussis injection was repeated 48 h after the initial injection. Following immunization, the mice were individually housed and fed 25 g/day of Gerber baby food that contained either 2 mg of WY14,643 dissolved in 0.221 ml of ethanol, 0.66 mg of WY14,643 dissolved in 0.221 ml of ethanol, or 0.221 ml of ethanol (control). Mice were graded daily for EAE disease activity as previously described (26). The mouse spleens were harvested, prepared into single-cell suspensions with a metal screen, and washed with RBC lysis buffer (20 mM Tris (pH 7.4), 0.83% NH4Cl). A total of 0.2 × 106 cells/well were plated in 96-well plates in RPMI 1640 (Life Technologies, Grand Island, NY) supplemented with 10% heat-inactivated FCS (Gemini Bio-Products, Calabasas, CA), 5.5 × 10−5 M 2-ME (Life Technologies), 130 U/ml penicillin, 130 μg/ml streptomycin, and 2.5 mM l-glutamine (Omega Scientific, Tarzana, CA). 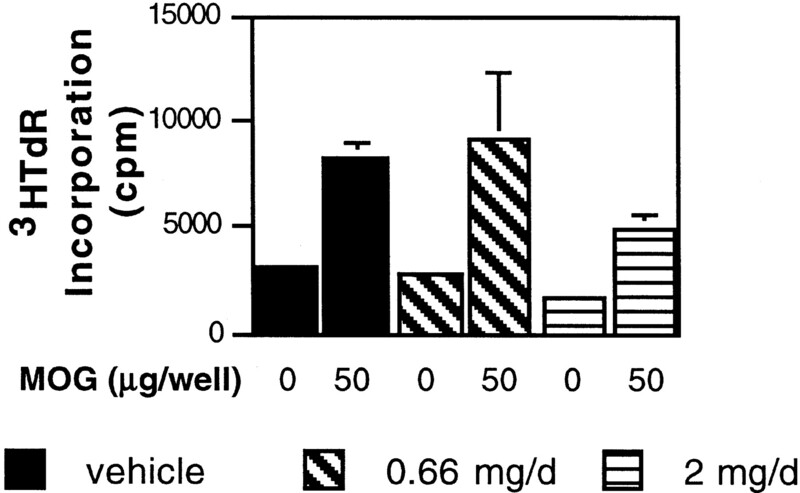 For proliferation studies, cells were treated with or without 50 μg/well of pMOG35–55 at day 0, pulsed at 72 h with 1 μCi/well [3H]thymidine (Amersham, Arlington Heights, IL), and harvested 24 h later. For apoptosis studies, splenocytes harvested from C57BL/6 and 129/Sv wild-type and KO mice were plated in 6-well plates (8 × 106 cells/8 ml), stimulated with Con A, and treated with 250 μM WY14,643 or vehicle control. After 24 and 72 h, cells were harvested, washed in PBS, and treated as described in the next section. A total of 2 × 106 cells were initially treated with Fc Block (anti-CD16/CD32; BD PharMingen, San Diego, CA), stained with anti-CD3ε-FITC, anti-CD45R/B220-PE, or anti-CD45R/B220-FITC (BD PharMingen) and then fixed in 50% ethanol. Fluorescence was measured with an Elite Flow cytometer (Becton Coulter, Mountain View, CA and Veterans Affairs San Diego Healthcare System Research Core FACS Facility, San Diego, CA). Cell cycle analysis was performed using propidium iodide (PI; BD Phar-Mingen). Complementary apoptosis studies were performed with the annexin V-FITC Apoptosis Detection kit (BD PharMingen). Annexin V binds to phosphatidylserine, which is expressed on the outer plasma membrane of cells undergoing apoptosis. Annexin V can also bind to necrotic cells, and PI is used to detect dead cells which have undergone either necrosis or apoptosis. Therefore, cells staining annexin V+, PI− were considered to be apoptotic, whereas annexin V+, PI+ cells were considered dead (27, 28). Culture supernatant concentrations of IFN-γ, IL-6, TNF-α, IL-4, and IL-2 were determined by sandwich ELISA with Abs purchased from BD PharMingen. Cytokine concentrations were determined from culture supernatants following 96 h of activation with pMOG35–55 except for IL-2 which was determined from 24-h cultures. Ab dilutions that maximized signal to noise were determined for each Ab pair and ELISAs were performed as previously described (29). Serum was collected from mice by terminal cardiac puncture. Briefly, 96-well Maxisorp microtiter plates were coated with pMOG35–55 (10 μg/ml in PBS) overnight at 4°C. Plates were blocked for 1 h with PBS containing 4% BSA (Sigma-Aldrich) and 0.05% Tween 20 (Sigma-Aldrich) and then incubated with serum samples for 2.5 h at 37°C. Plates were developed with anti-IgG (Calbiochem, San Diego, CA), anti-IgG1 (Caltag Laboratories, Burlingame, CA), or anti-IgG2a (BD PharMingen) alkaline phosphatase conjugates at 37°C for 2.5 h. Plates were incubated with p-nitrophenylphosphate disodium (1 mg/ml in 1 M carbonate buffer pH = 9.6; Sigma-Aldrich) at room temperature. Samples were evaluated in a microplate reader (Molecular Devices, Sunnyvale, CA) at 405 nm. Splenocytes isolated from BALB/c mice were stimulated with Con A and harvested at 24 h and 72 h after stimulation. For T and B cell separations, splenocytes were stained with anti-CD3ε-FITC (T cell marker) and anti-CD45R/B220-PE (B cell marker) and separated by MOFLO (Cytomation, Fort Collins, CO and Veterans Affairs San Diego Healthcare System Research Core FACS Facility). RNA was prepared with the Qiagen RNeasy kit (Qiagen, Valencia, CA) and treated with Dexoxyribonuclease I (Invitrogen, Carlsbad, CA). cDNA was prepared with the Superscript II Preamplification system (Invitrogen) according to the manufacturer’s instructions. TaqMan PCRs were run by the Center for AIDS Research Genomics Core (University of California, San Diego, Veterans Medical Research Foundation) using an ABO Prism 7700 Sequence Detector (TaqMan; Applied Biosystems, Foster City, CA). GAPDH cDNA was used as an internal standard. Primers for PPARα were: PPARα-1293F, GGA CCT TCG GCA GCT GGT; mPPARα-1358R, TCG GAC TCG GTC TTC TTG ATG; and mPPARα-1313T (probe), CGG AGC ATG CGC AGC TCG TAC A. Differences were statistically analyzed using the Student’s t test, one- and two-way ANOVAs with post-hoc Tukey tests for pairwise comparisons. Analysis was accomplished with Statview version 5.0.1 (SAS Institute, Cary, NC). Our previous studies demonstrated profound in vitro effects of WY14,643 and other fibrates on mitogen-activated splenocytes (10). The current studies were designed to assess the effects of WY14,643 on induced immune responses in vivo. Cohorts of C57BL/6 mice were singly housed and fed vehicle or one of two doses of WY14,643 (2 and 0.66 mg/day). All of these groups were immunized with pMOG35–55/CFA. Ten days following immunization, mice were euthanized and sera and spleens were harvested from all animals. Splenic weights, total splenocyte cell counts, recall proliferative responses to myelin oligodendrocyte glycoprotein peptide, and cytokine production were evaluated. Gross inspection of the peritoneal cavity at the time of sacrifice revealed that the spleens from WY14,643-treated animals were markedly smaller than spleens from vehicle-fed mice. There was a dose-dependent diminution in splenocyte number in WY14,643-treated animals compared to the immunized, vehicle-fed cohort (Fig. 1⇓). Fig. 2⇓ depicts the mean [3H]TdR uptake in response to pMOG35–55 in splenocytes from the three experimental groups. Splenocytes from animals fed 2 mg/day of WY14,643 had lower [3H]TdR uptake than those fed 0.66 mg/day or vehicle, but these differences did not attain statistical significance. Thus, WY14,643 in a dose-dependent manner elicits a decrease in splenocyte number in immunized mice, but it does not markedly alter the proliferation of these cells in a recall response to pMOG35–55. WY14,643 feeding causes a dose-dependent decline in splenocyte number in immunized mice. C57BL/6 mice were immunized with pMOG35–55/CFA and fed either vehicle, 0.66 mg/day, or 2 mg/day of WY14,643. ∗, p < 0.05 vs vehicle, bars represent SE. There is no alteration in the recall proliferative response with WY14,643 feeding. Splenocytes from C57BL/6 mice immunized with pMOG35–55/CFA were stimulated with pMOG35–55 50 μg/well, pulsed at 72 h with [3H]thymidine and harvested 24 h later. Bars represent SE. We next assayed supernatants from parallel cultures for cytokines produced in response to challenge with pMOG35–55. In vivo exposure to WY14,643 significantly inhibited IFN-γ, IL-6, and TNF-α produced in response to MOG35–55 (Fig. 3⇓). The concentrations of IL-2 and IL-4 assayed were low in all of the groups and not detectably different. In vivo exposure to WY14,643 inhibits cytokines produced in response to pMOG35–55. Splenocytes from C57BL/6 mice immunized with pMOG35–55/CFA were incubated with or without pMOG35–55 50 μg/well. A, IFN-γ levels; B, IL-6; and C, TNF-α. IL-2 and IL-4 levels were undetectable. ∗, p < 0.05 vs stimulated vehicle. ELISAs for pMOG35–55-specific Igs were performed on sera from the three experimental groups. Sera were assayed for total IgG, IgG1, and IgG2a directed against pMOG35–55 (Fig. 4⇓). pMOG35–55-specific IgG1 and total IgG were suppressed in sera from animals exposed to WY14,643 when compared to vehicle-treated animals. Mice fed WY14,643 display impaired IgG responses to pMOG35–55. Sera were evaluated by ELISA for titers of pMOG35–55-specific Igs from C57BL/6 mice immunized with pMOG35–55/CFA. A, Total IgG; B, IgG1; and C, IgG2a. ∗, p < 0.05 vs same titer of vehicle-treated sera. Given these profound effects of WY14,643 on induced immune responses to pMOG35–55, we were curious to determine if it could suppress the expression of encephalomyelitis induced by pMOG35–55/CFA. To induce symptomatic disease in C57BL/6 mice, pertussis toxin must be administered twice: once at the time of immunization and 48 h afterwards. Unfortunately, we were unable to create a protocol that was not lethal to the WY14,643-treated animals. In these experiments, the immunized mice treated with vehicle alone developed disease on a typical time course. The combination of WY14,643 administration and pertussis toxin leads to a very high mortality rate in immunized mice for reasons that are still under investigation. In vivo administration of WY14,643 results in diminished spleen size and marked loss of lymphocytes. The next set of studies were designed to determine whether the WY14,643-induced decline in splenocyte number also occurred in nonimmunized mice. Cohorts of C57BL/6 mice were housed singly and fed either vehicle, 0.66, or 2 mg/day of WY14,643 for 6 or 10 days. Again, gross inspection of the peritoneal cavity revealed that the spleens from WY14,643-treated animals were markedly smaller than spleens from vehicle-fed mice. Both spleen weights and splenocyte counts in the WY14,643-treated groups were depressed (Table I⇓). Flow cytometry of splenocytes stained with anti-CD45R/B220 and anti-CD3ε demonstrated that both T and B cells were markedly diminished following 6 days of in vivo treatment. In the next set of experiments depicted in Fig. 5⇓, six treatment groups were assessed. Animals were treated with 2 mg/day of WY14,643 or vehicle control for 8 days. Mice were then euthanized on days 8, 18, and 29 to assess whether the decrements in splenocyte number were reversible. On day 8, there was a >60% decline in splenocyte number in the WY14,643-treated animals when compared to the vehicle controls. On days 18 and 29, the splenocyte number had increased. Of note, the ethanol-treated group also had a decline in lymphocyte number that increased on day 18. This effect of ethanol has been previously reported (30). FACs analysis confirmed that there were decreases in both the CD4+ and CD45R/B220+ populations. Each cell population increased after treatment was stopped such that the normal percentages were again present in the spleen. We attempted to determine whether this effect of WY14,643 required PPARα, by comparing the effects of feeding WY14,643 to PPARα KO mice on the 129/Sv background and their wild-type littermates. Interestingly, WY14,643 did not elicit splenocyte depletion in the wild-type control mice. Therefore, we were unable to determine whether PPARα is required for this effect. This result implies that the effect of WY14,643 on splenocyte number is dependent, at least in part, on genetic background. The splenocyte depletion induced by WY14,643 is reversible. C57BL/6 mice were fed WY14,643 for only 8 days. Splenocytes were counted at days 8, 18, and 29. FACs analysis was performed for CD45R/B220+ (B) and CD4+ (C) cells. There were decrements in both cell populations. ∗, p < 0.05 vs day 8 control; ∗∗, p < 0.05 vs day 8 WY14,643 treatment. n = 4 or 5 for each group. Our early studies revealed that PPARα is expressed in splenocytes early in the course of Con A-induced activation. TaqMan PCR studies performed on Con A-activated splenocytes confirm these findings and demonstrate that PPARα is more highly expressed in B than T cells (Fig. 6⇓). PPARα is more highly expressed in B than T cells. 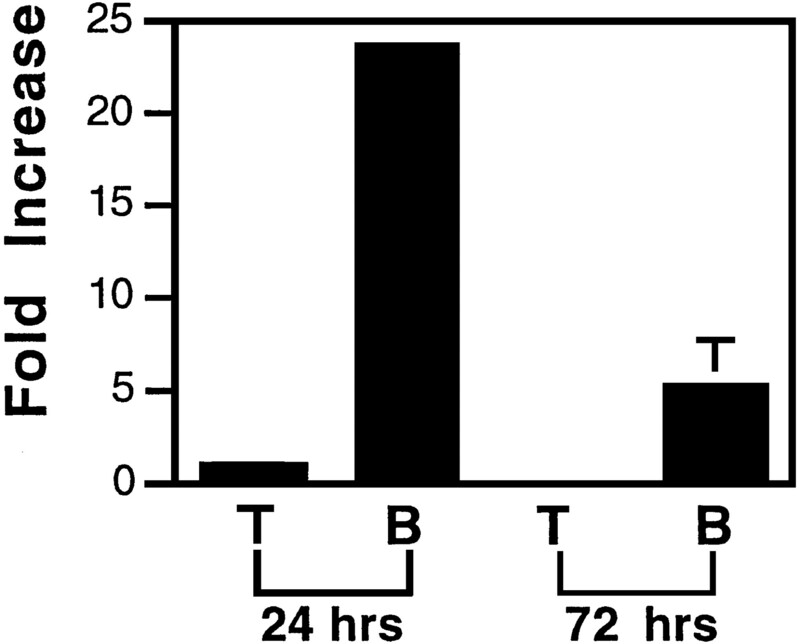 Con A-activated splenocytes from BALB/c mice were harvested at 24 and 72 h after activation and separated into T and B cells as described in the text. TaqMan (real time) PCR was performed for PPARα. Data are represented as fold increase when compared with the control GAPDH cDNA. Cell cycle studies were performed on activated splenocytes isolated from C57BL/6 mice exposed in vitro to 250 μM WY14,643 or vehicle for 72 h. After the cells were harvested they were stained with anti-CD4-FITC, anti-CD45R/B220-FITC, and PI and analyzed by flow cytometry. In Fig. 7⇓, A and B, vehicle- and WY14,643-treated splenocytes (respectively) were stained with PI and cell cycle analysis was performed. The population of apoptotic cells is represented by the sub-G1 peak of the cell cycle. In the vehicle-treated group, 8.7% of the total cells were apoptotic. Treatment with WY14,643 increased the number of apoptotic cells to 32.9%. There were similar increases in apoptosis in both B and T cells (data not shown). Complementary studies using annexin V show a 2-fold increment in the number of apoptotic cells. A total of 12% of the cells in the vehicle-treated group were annexin+/PI− compared with 24.4% of annexin+/PI− cells in the WY14,643-treated group (Fig. 7⇓, C and D). It is possible that this effect on apoptosis may be a mechanism leading to splenocyte depletion. However, further studies will be performed to study this hypothesis. WY14,643 induces apoptosis in C57BL/6 splenocytes. Splenocytes isolated from C57BL/6 mice were stimulated with Con A and treated with 250 μM WY14,643 (B and D) or vehicle control (A and C). A and B represent cell cycle analysis performed with PI staining. 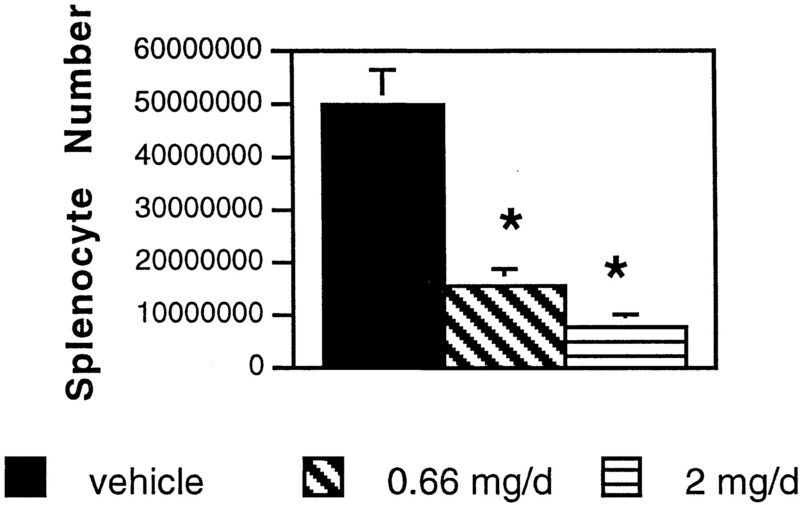 The percentage represents the number of apoptotic cells (sub-G1). C and D, Annexin V staining of splenocytes. Cells staining annexin V+, PI− were considered to be apoptotic, whereas annexin V+, PI+ were considered dead. To investigate whether the effect on apoptosis induced by WY14,643 occurred in a PPARα-dependent or -independent manner, splenocytes from PPARα wild-type and KO mice were stimulated with Con A and treated with 250 μM WY14,643 or vehicle. Fig. 8⇓ depicts the WY14,643-induced increase in apoptosis in both the wild-type and PPARα KO mice. 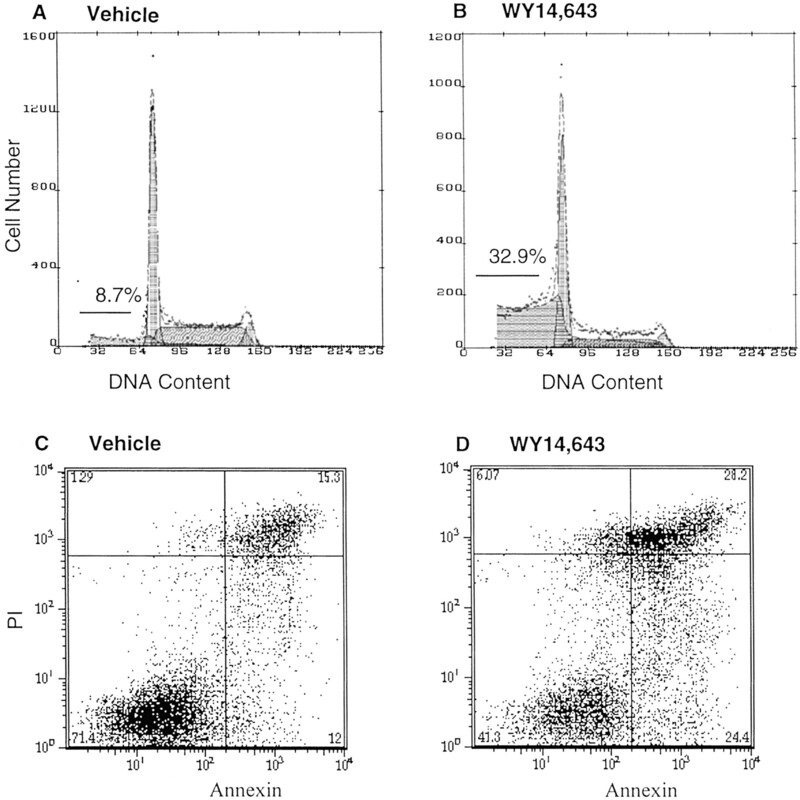 These data suggest that WY14,643 causes apoptosis independent of the expression of PPARα. WY14,643 induces apoptosis in a PPARα-independent manner. Splenocytes isolated from PPARα wild-type and KO mice (PPARα KO) were stimulated with Con A and concomitantly treated with 250 μM of WY14,643. Cell cycle studies were performed by PI staining and FACS analysis. Percentages represent percentage of apoptotic cells. Treatment with WY14,643 caused similar changes in cell cycle parameters in splenocytes isolated from wild-type and PPARα KO mice. Our early in vitro studies demonstrated that PPARα ligands induce expression of IL-4 (10). The current studies have focused on the in vivo effects of this agent. Notably, feeding of WY14,643 causes profound lymphocyte depletion in animals immunized with pMOG35–55/CFA. Moreover, the immune responses induced to pMOG35–55/CFA are markedly depressed. Total IgG and IgG1 are reduced and the production of IFN-γ, IL-6, and TNF-α are depressed in a dose-dependent manner in WY14,643-fed animals. This occurs in the absence of an alteration in the recall proliferative response to Ag. Similar to the effect in immunized animals, feeding of WY14,643 to naive C57BL/6 mice leads to massive lymphocyte depletion in the spleen. After 6–10 days of therapy, dramatic depletion is seen in both the CD4+ T cell compartment as well as the CD45R/B220+ B cell compartment, and this is reversible after the agent is stopped. The current TaqMan PCR studies demonstrate that PPARα is more highly expressed in B than T cells. Interestingly, in vitro treatment of splenocytes with WY14,643 induces apoptosis of both B and T cell populations. These effects appear to occur in a PPARα-independent manner. Fibrates, PPARα ligands, are anti-inflammatory. PPARα is important in controlling the duration of inflammation induced by leukotriene B4 and arachidonic acid, and PPARα KO mice demonstrate a prolonged response to inflammatory stimuli (17). Studies by Daynes and colleagues (31) have shown that in vivo administration of PPARα ligands to aged mice diminishes their augmented NF-κB levels. Fibrates may also inhibit NF-κB DNA binding activity by augmenting the expression of IκBα (32). In addition, in vivo administration of WY14,643 to aged mice corrects the dysregulation of IFN-γ and splenic inducible NO synthase, as well as the elevated splenocyte levels of IL-6 and IL-12 (31, 33). In the current study, the declines in IL-6, TNF-α, and IFN-γ depicted in Fig. 3⇑ are likely multifactorial. Promoter studies have shown that fibrates repress both c-Jun and p65-induced transcription of the IL-6 promoter (34). Similarly, Combs et al. (35) have shown in THP-1 monocytes that PPARα agonists inhibit the β-amyloid-stimulated expression of TNF-α and IL-6. Our previous studies have shown in vitro that the decrease in IFN-γ induced by WY14,643 is secondary to increases in IL-4 (10). Furthermore, preliminary studies with IFN-γ promoter constructs do not show a direct effect of WY14,643 on this promoter (R. Cunard and M. Ricote, unpublished observations). In the current studies, we expected to see higher levels of IL-4 in the WY14,643-treated animals. However, the current experiments were performed in C57BL/6 mice which in induced immune responses produce much lower levels of IL-4 than BALB/c mice (10). It is possible that the levels of IL-4 were higher in the treatment groups and that our studies lacked the sensitivity to detect these differences. Atherosclerosis is currently characterized as an inflammatory disorder associated with the recruitment of lymphocytes and macrophage/monocytes (36). For >30 years, fibrates have been effective therapeutic agents, but it is increasingly evident that effects distinct from their lipid lowering capacity may contribute to their efficacy (reviewed in Ref. 37). In hyperlipidemic patients, fenofibrate treatment was associated with a decline in TNF-α and IFN-γ levels (38). In a similar manner, whole-blood aliquots isolated ex vivo from hyperlipidemic patients produced higher concentrations of TNF-α and IL-6 in response to LPS. Treatment of these patients with bezafibrate reduced the ability of their activated PBMCs to produce these cytokines (39). Our findings parallel those of Yang and colleagues (40, 41) who demonstrated splenic and thymic atrophy in C57BL/6 mice fed perfluorooctanoic acid, a peroxisome proliferator agent. Moreover, they recently reported a similar suppression of Ag-specific serum IgG and IgM in mice immunized with horse RBCs (42). Their studies demonstrate a diminished proliferative response to Con A and LPS, which contrasts with our findings of an intact recall proliferative response. This may be due to the nonspecific nature of their stimuli vs the specific recall agent used in our studies. Enioutina et al. (43) have shown enhancement of mucosal and systemic humoral responses in aged animals fed WY14,643. They hypothesize that this PPARα ligand ameliorates dysregulated cytokine production, which favors the normal production of protective Abs. Their studies show enhanced humoral immunity with WY14,643 feeding which contrasts with our findings of reduced Ab production. This discrepancy could be explained by the differences in the type of immune responses studied, protective vs disease induction. Also, we used higher concentrations of WY14,643 in our studies which could have caused a more pronounced effect on B cells. Further supporting our findings, perfluorodecanoic acid, another PPARα ligand, significantly decreases keyhole limpet hemocyanin-specific IgG2a production (44). The observation that PPARα is more highly expressed in B than T cells parallels the findings of Jones et al. (9); however, their studies support the concept that PPARα expression wanes soon after lymphocyte activation. To investigate the mechanism contributing to splenocyte depletion, we treated splenocytes with WY14,643. In vitro administration of WY14,643 induces apoptosis in both B and T cells. Investigators have shown that PPARα and PPARγ ligands induce apoptosis in macrophages (45). However, Harris et al. (13) were only able to demonstrate apoptosis in T cells treated with PPARγ ligands. It is possible that they did not use a high enough concentration of PPARα ligands in their studies. Given the evidence of apoptosis in T cells, which presumably don’t express high levels of PPARα, we chose to examine whether the apoptotic effect occurred in a PPARα-dependent or -independent manner. Splenocytes from PPARα KO mice and wild-type littermates were treated in vitro with WY14,643. Both the wild-type and KO mice demonstrated a higher percentage of apoptotic cells when treated with WY14,643. It is clear from our studies that this effect on cell cycle occurs in a PPARα-independent manner. Although we only see a 2- to 3-fold increase in the number of apoptotic cells with WY14,643 treatment, it is important to consider that our studies only examined single time points. It is possible that prolonged therapy with this agent elicits an additive effect which could account for the observed profound splenocyte depletion. It is also likely that other mechanisms may also contribute to splenocyte depletion. These observations are significant as patients on fibrates may not elicit appropriate immunologic responses to life-saving vaccines such as Streptococcus pneumoniae. It is also possible, given their potent effect on humoral immunity, that they may prove efficacious in treating Ab-mediated autoimmune diseases such as systemic lupus erythematosus and autoimmune glomerular basement membrane disease. Our initial interest was to examine the effects of fibrates on EAE. Induction of EAE with pMOG35–55/CFA requires i.p. administration of pertussis toxin. We consistently observed that the combination of pertussis toxin, immunization, and WY14,643 treatment caused mortality 5–10 days following immunization. Therefore, we are currently investigating the effect of fibrates in other models of autoimmune disease that do not require the use of pertussis toxin. Fibrates are used extensively to treat hypertriglyceridemia. Given the profound effect of WY14,643, a fibrate, on induced immune responses, it will be of utmost importance to further characterize the immunomodulatory effects of these agents. We thank Judy Nordberg and the rest of the staff at the San Diego Veterans Affairs Healthcare System Research Core Flow Cytometry facility. We thank Christine Plotkin and the Center for AIDS Research Genomics Core facility (University of California San Diego, Veterans Medical Research Foundation) for performing the TaqMan PCR studies. We also thank F. J. Gonzalez for providing the PPARα KO mice. ↵1 This work was supported by National Institutes of Health Grant DK45346 (to C.J.K.) and P42ES10337 (to C.K.G. ), Department of Veterans Affairs Career Development Grant (to R.C.) and Veterans Affairs Merit Review Grant (to C.J.K.). D.D. was supported by a National Kidney Foundation Fellowship award. M.R. was supported by the American Heart Association, Western Affiliates Beginning Grant-in-Aid. ↵2 D.D. was a first author on this manuscript. ↵4 Abbreviations used in this paper: PPAR, peroxisome proliferator-activated receptor; EAE, experimental allergic encephalomyelitis; pMOG35–55, myelin oligodendrocyte glycoprotein peptide 35-55; PI, propidium iodide; KO, knockout.